The Natural Opulance Divan Bed is made in a very modern style. It is finished in chocolate brown material with a headboard incorporating six vertical panels. 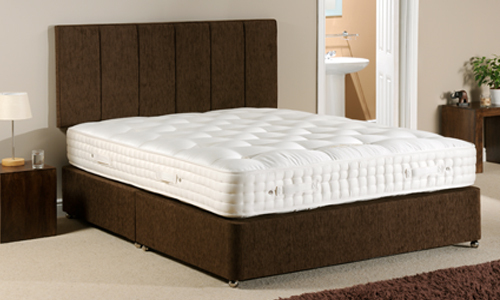 The Opulance divan bed base is made with individual pocket springs set on a solid timber base. 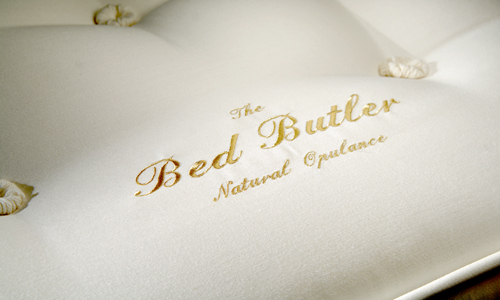 These are covered in wool and cotton padding to give extra comfort and protection to the mattress. The base is divided across the middle for ease of transporting and then zipped together in the bedroom. When zipped together in the bedroom they give firm support to the mattress without any feeling from the join. The divan is available with drawers set into the base to give extra storage facilities within the bedroom. But the van is supported by small domed shaped feet making it easy to move when cleaning or changing the bed linen. The Natural Opulance Mattress is a luxurious pocket spring mattress with incredibly sumptuous natural filling materials giving ultimate comfort and support. It has 1600 individual pocket spring glued together but allowing each spring to act individually. This independent movement will let the mattress flex to the shape of your body and provide the ideal support for your spine and resulting in perfect comfort. The mattress upholstery’s made up of four layers, the first layer is made from Vertifill wool and is 500g per panel. The second layer is 1500g per panel of Horsetail. The third layer is made from Wild White Horse Hair and a top layer of 1500g per panel of Needle White Cashmere and Silk. The Vertifill gives softness and extra loft to the mattress and is ideal for dissipating heat. The horse hair is used to ensure that the pocket springs are covered to give a protective layer between the pocket springs and softer materials used. Horse hair has the advantage that the long natural fibres adds substantially to the springiness of the mattress. The Cashmere and Silk layer is one of the softness fibres available and gives the mattress an added dimension in comfort. As is the case with wool, Cashmere has the inherent property of being able to breathe, keeping the bed at an ideal temperature whatever it might be in the rest of the bedroom. The mattress has a Tack and Jump border with three layers of wool interliner ensuring that the edges of the mattress will always give the right support. It has three rows of hand stitching around the sides. The corners of the mattress include a pad of lambs wool. There are six horizontal handles, two on each side and one at each end of the smaller size mattress. There are eight horizontal handles, two on all four sides for the wider mattresses. Eight vents are also included into the sides of the mattress giving it perfect ventilation at all times.